Yes, it's true. My heart is on fire. 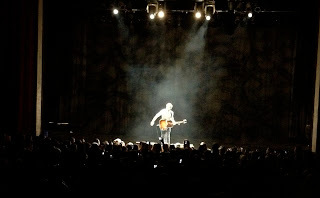 Ok, to be fair, it already was, but I'm on a high from last night's Passenger concert at the Vogue Theatre in Vancouver. I arrived in Canada yesterday and barely had time to settle in before the lovely one took me out for a night on the town. We arrived in the middle of the opening act's set, and unfortunately I didn't catch his name, but it was a delightful start. But I was really inspired by the second act, a young man named Joshua Hyslop, who performed on his acoustic guitar with a cello for accompaniment. The crowd was predominantly female (of all ages) and there were some drunken members there, especially the older women who kept yelling "You're ADORABLE!" at him. And to be fair, he was very adorable, and extremely talented. I look forward to hearing more from him. After a year and a half away I'm back living in Los Angeles. I've missed it, and I forget the feeling it gives me when I'm here. I know a lot of people aren't LA fans, and to each their own, but for me it feels nourishing. That's not to say I don't have my freak-outs, or anxiety attacks (just had one earlier this evening to be fair! ), but I feel like I'm moving forward at least through all of that.